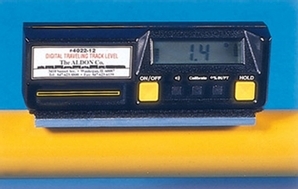 Attaches with Velcro to either Economy Rolling Track Gauge Reader (4022-10) and Roadmaster Rolling Gauge Reader (4022-14). Liquid crystal display has 1/2" numerals readable from 10 feet away. Measures elevation in 10ths of an inch per foot.